The Strategic Planning Process Template outlines the planning process for the determination and selection of new IT systems in an organization. The overview page (A — Strategic Planning) moves from target selection to requirements definition to the decision phase, and includes links to placeholder pages for the detailed definition of the three decision outcomes. In addition, it also includes a sub-process page (AG — High-level Business Case) to illustrate how the Sub-process TaskID field is used in Task A07. In Task A02 (and others on this page), notice that the Supporting Role is the name of a group rather than an individual role. Although providing separate role names is usually desirable when creating TaskMaps, using a group name is often appropriate when three or more people consistently work as a group throughout a process. Note the use of the Sub-process TaskID field in Task A07. The Sub-process TaskID indicates that Task A07 is broken down into more detail on another page, in this case page AG. Think of the current page as the 35,000-foot view of the process and page AG as the 5,000-foot view of the details. Note also that the Sub-process TaskID is hyperlinked to the sub-process page. Page B is just a placeholder. The real definition of this portion of the process would require more than one Task. The Process Connector Labeled E01 leads to a continuation page (not included) that involves creating training for the new work processes. Page C is really just a placeholder. The real definition of this portion of the process would require more than one Task. 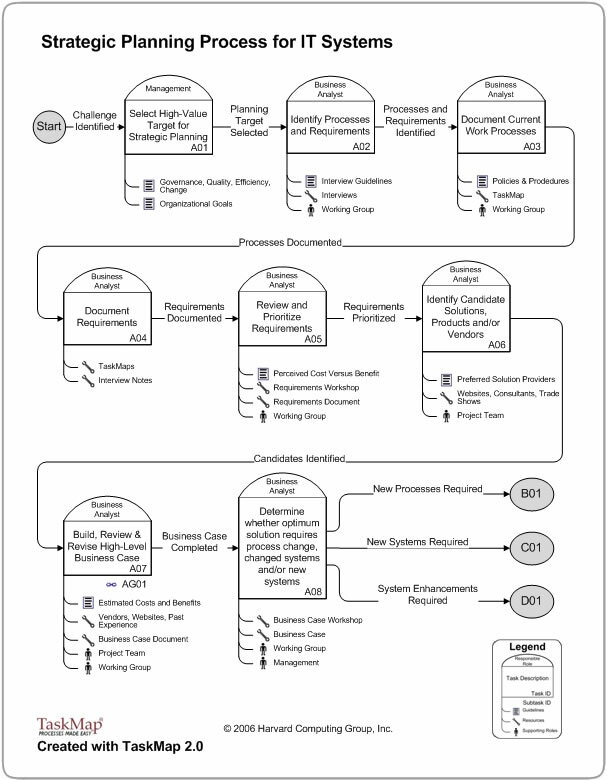 The Process Connector Labeled F01 leads to a continuation page (not included) that defines the procurement process for the new system. Page D is really just a placeholder. The real definition of this portion of the process would require more than one Task. The Process Connector Labeled G01 leads to a continuation page (not included) that defines the development process for the new system. This page contains the sub-process for Task A07, so note that the map begins and ends with Process Connectors labeled A07. In a more complete version of this map, this page might contain additional tasks. For example, Build business case (AG01) might require multiple tasks instead of the one shown here, and might involve multiple roles. Task AG02 has two obvious outcomes: Business case approved and Revisions required. It also includes a less likely but very real possibility, Business case rejected, which causes the Business Analyst to start again.